"Sitting quietly, doing nothing, spring comes and the grass grows by itself." 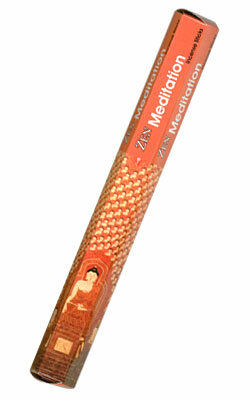 "Zen Meditation" is a Kamini Incense from their highest, premium quality Masala range. A beautiful, calming fragrance to aid you in contemplace, meditation and peace. This 20 gram hexagonal package contains approximately 20 sticks of incense and is beautifully designed to reflect the nature of its wonderful fragrance. Very popular in Australia, New Zealand and throughout Europe, Kamini incense has only recently been introduced to the American market. It is imported from India and made according to ages-old traditional methods by hand.